Godalming Band and Godalming Youth Band invite you to join us for our traditional joint Christmas concert at Godalming United Church this December. 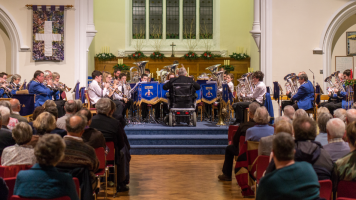 We’ll have an evening of festive music in store, including our favourite carols arranged for brass band. Our Christmas-themed CD, “The Festive Season”, will also be available for any last-minute Godalming-themed gifts, as well as refreshments and a raffle. Doors open at 6.30pm for a 7pm start on Saturday 15th December, at Godalming United Church, Bridge Street, Godalming.